One common lament about those deciding to go on the Paleo diet is having to give up bread. But just because you can’t eat what and grains anymore doesn’t mean you can’t enjoy nice slice of bread or two, just as long as it conforms to the Paleo dietary recommendations. 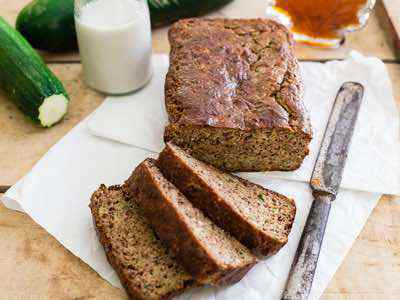 Here is our select list of wheat-free, grain-free paleo bread recipes that you can use for sandwiches, toast, or just to enjoy on their own. 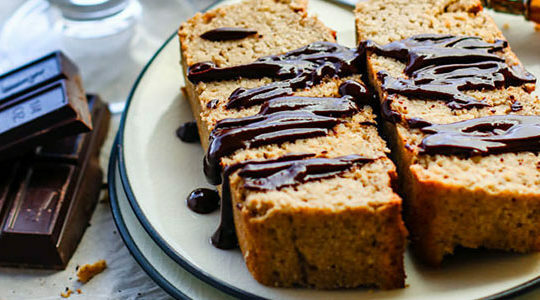 The best paleo banana bread becomes an extra special treat with the addition of dark chocolate. The bread makes an excellent breakfast with some coffee or tea, or you can enjoy it as your afternoon snack. 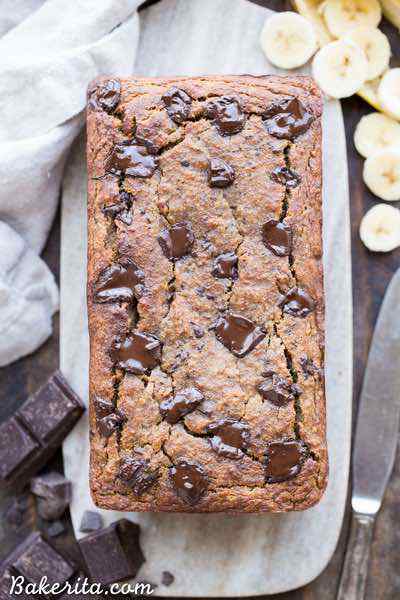 One thing is for sure – a loaf of this delicious chocolate swirl banana bread won’t last long! 1. Preheat the oven to 350 degrees F. Line a regular loaf pan with parchment paper. In a large bowl, add the bananas, eggs, almond butter, 4 tablespoons of coconut oil, and vanilla. Use a hand blender to combine well. 2. Add in the coconut flour, cinnamon, baking soda, and salt. Blend into the wet mixture, scraping down the sides with a spatula. 3. 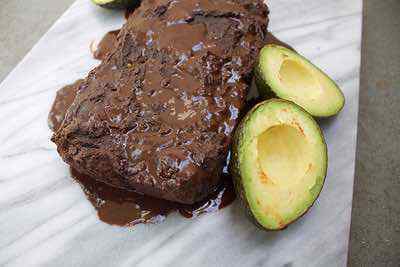 Melt the chocolate in a bowl in the microwave along with the remaining tablespoon of coconut oil. Stir to combine. 4. Pour the bread batter into the loaf pan. Top with the melted chocolate and use a knife to swirl the chocolate into the batter. Bake for 50-60 minutes, until a toothpick inserted into the center comes out clean. Place the bread on a cooling rack and allow to slightly cool before slicing, about 15 minutes. 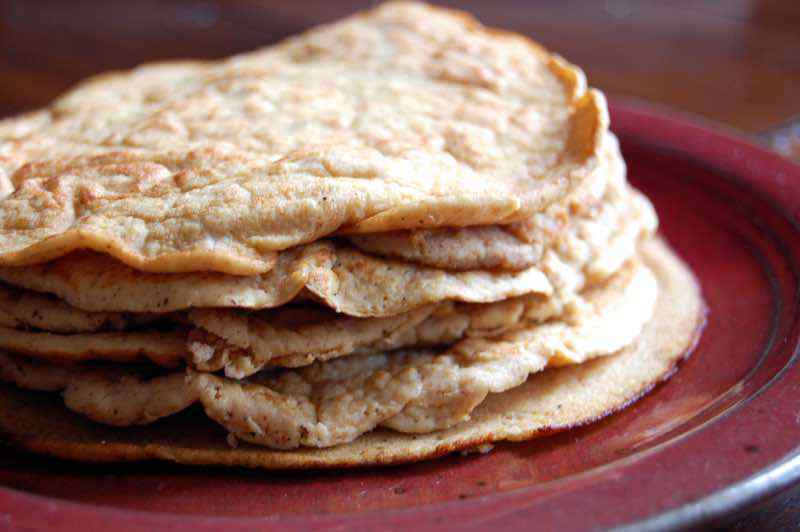 A blend of egg whites and coconut flour can make a tasty Paleo version of tortillas. 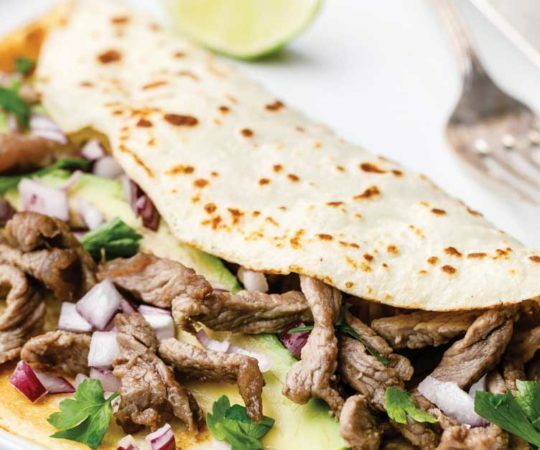 Whether used for tacos or quesadillas, this recipe makes about 8 medium tortillas, which are best served right off the stove. Feel free to adjust the spices in the tortillas to your taste preferences. 1. 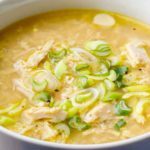 In a small bowl, combine all of the ingredients and mix well. Allow the batter to sit for approximately 10 minutes to allow the flour to soak up some of the moisture, and then stir again. The consistency should be similar to crepe batter. 2. Heat a non-stick skillet to medium-high heat. Coat pan with coconut oil spray. Pour about 1/4 cup of batter onto the skillet, turning the pan with your wrist to help it t=spread out in a thin, even layer. Cook for 1-2 minutes, loosening the sides with a spatula. When the bottom has firmed up, carefully flip over and cook for another 2-3 minutes until lightly browned, then set aside on a plate. Repeat with remaining batter. Serve warm. 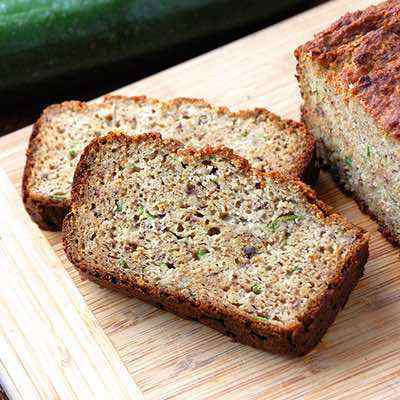 Zucchini bread is an easy and excellent way to incorporate summer squash into paleo bread baking. 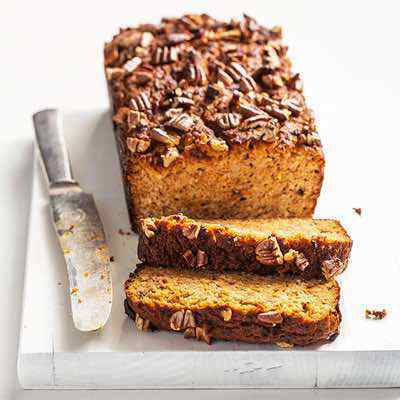 The ingredients can be split up into two mini loaves or cooked together in one large loaf. 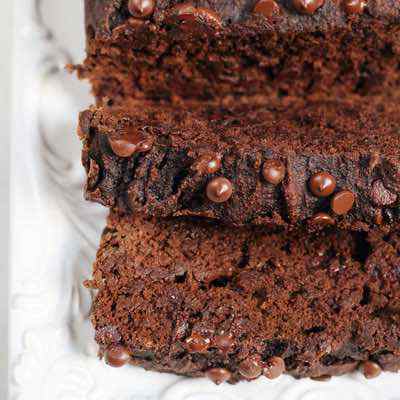 Chocolate chips, raisins, and walnuts can also be incorporated into the moist, flavorful bread if desired. 1. Preheat the oven to 350 degrees F. Line a loaf pan with parchment paper. Squeeze any excess moisture out of the shredded zucchini. Whisk together the almond flour, coconut flour, baking soda, and salt in a medium bowl. 2. In a separate bowl, add the eggs, honey, banana, coconut oil, and apple cider vinegar. Use a hand blender to combine. Add the dry ingredients into the wet and stir to combine. Fold in the shredded zucchini. 3. Pour the batter into the loaf pan. Bake for 30-35 minutes, until the loaf is set. Remove from the oven and let cool for 5 minutes before serving. This sweet paleo bread is more of a dessert than anything else (but also makes the perfect paleo snack). 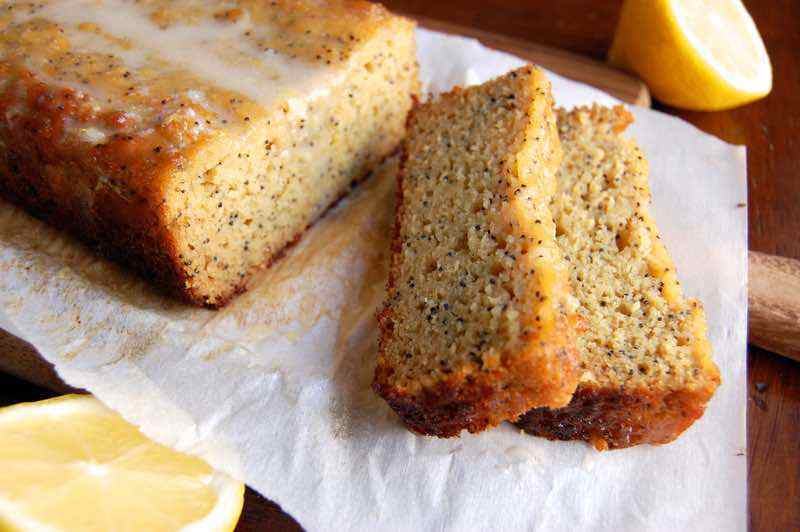 Bright, zesty lemons add a tart bite and poppy seeds add crunch to the loaf. If you want to add the coconut lemon glaze, let the glaze and the loaf of bread chill in the refrigerator before applying. 1. Preheat the oven to 350 degrees F. Line a bread pan with parchment paper. To make the lemon glaze, place all of the ingredients into a small saucepan and bring to a simmer. Remove from heat and let cool. Transfer to a bowl and place in the refrigerator to cool completely. 2. In a large bowl, add the coconut oil, honey, eggs, lemon juice, lemon zest, and vanilla. Use hand blender to combine. Stir in the coconut flour, baking soda, and salt with a spatula. Fold in the poppy seeds. 3. Transfer the batter to the loaf pan. Bake for 25-30 minutes until set. Let cool on a wire rack for 10 minutes before serving. Drizzle with lemon glaze if desired. On the weekends, I love waking up to a hearty brunch with bagels, smoked salmon and scrambled eggs. Bagels are one of the things I miss the most being on the Paleo diet, but today I’ve found the solution. We’re going to make paleo bagels – delicious, yeast-free, and low-carb bagels that you’re absolutely going to love, ready in just 40 minutes! Start off by pre-heating your own to 350 degrees Fahrenheit (180 degrees Celsius) and greasing a non-stick donut or bagel pan. In a large bowl, combine almond flour, flaxseed meal, tapioca starch, baking powder and salt and mix very well. Add in the beaten eggs and apple cider vinegar and then mix until you get a homogeneous batter. Now that you have the batter ready, pour the batter into a piping bag, or a re-sealable plastic bag, then cut off one corner and pipe the batter into the prepared pan, filling each cavity ¾-full. Sprinkle the seeds of your choice on top of the batter (I like a mix of sesame seeds, flaxseeds and sunflower seeds), and then bake for 20 to 25 minutes, until a toothpick inserted in the middle comes out clean. 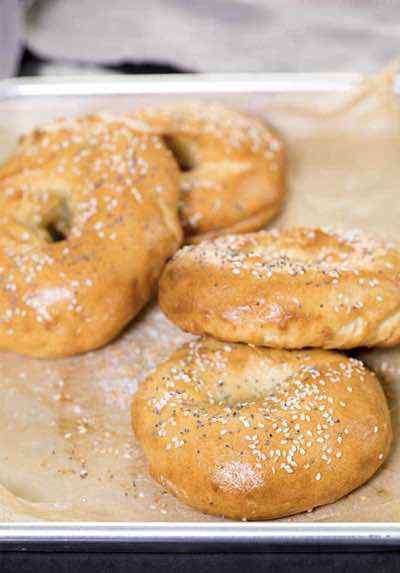 Allow the bagels to cool for at least 10 minutes before removing them from the pan, then tuck in and enjoy! 1. Pre-heat oven to 350 deg. Fahrenheit (180 deg. Celsius) and grease a non-stick donut or bagel pan with coconut oil. 2. In a large bowl, combine almond flour, flaxseed meal, tapioca starch, baking powder and salt and mix very well. 3. Add in the beaten eggs and apple cider vinegar and mix until you get a homogeneous batter. 4. Pour batter into a piping bag (or a re-sealable plastic bag), cut off one corner and then pipe the batter into the prepared pan, filling each cavity 3/4-full. 5. Sprinkle sesame seeds, flaxseeds and sunflower seeds on top of the batter. 6. Bake batter for 20 to 25 minutes, until a toothpick inserted in the middle of a bagel comes out clean. 7. Allow bagels to cool for at least 10 minutes in the pan before removing them. 8. Store bagels in an airtight container in the refrigerator for up to 3 days or in the freezer for up to 3 months. Once in a while, I like to allow myself the luxury of eating a rustic country loaf. 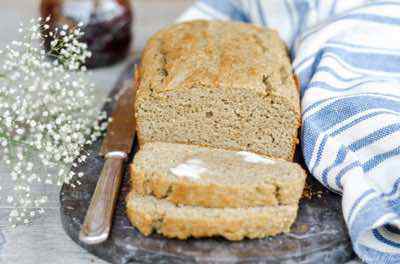 There’s something so warm and comforting about a country loaf style bread, and this recipe is one that makes use of cashew meal and yeast to give it the beautiful texture that it has. Start off by combining active dry yeast, coconut sugar and warm water in the large bowl. Mix well and let the mixture sit for five minutes until it becomes frothy. Add in the egg, olive oil and apple cider vinegar to the yeast mixture and whisk until well combined. In a medium bowl, combine the cashew meal, tapioca starch and salt and mix well. Sift the dry ingredients into the bowl with the wet ingredients and stir the mixture vigorously with a wooden spoon for thirty seconds until you get a wet and shaggy dough. Next, cover the bowl with a tea towel and place it in a warm place, letting it rise for the next 60 to 90 minutes until it has doubled in size. As the dough is rising, pre-heat the oven to 400 degrees Fahrenheit (200 degrees Celsius) and grease a baking sheet. Once the dough has doubled in size, place it on the prepared baking sheet and shape into a round loaf. Cut two lines on top of the dough with a sharp knife and then bake the dough for 40 to 45 minutes until bread is golden brown on top. 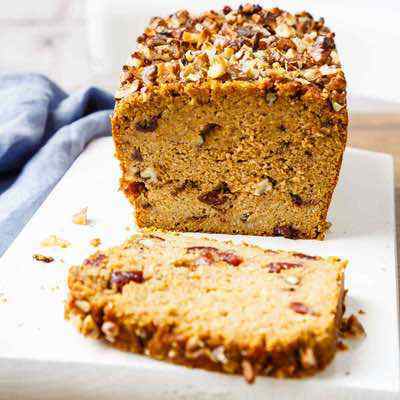 Allow the rustic paleo country loaf to cool completely before slicing into it and enjoy! 1. In a large bowl, combine active dry yeast, coconut sugar and warm water. Mix well and let the mixture sit for five minutes until it becomes frothy. 2. Add in the egg, olive oil and apple cider vinegar to the yeast mixture and whisk until well combined. 3. In a medium bowl, combine cashew meal, tapioca starch and salt and mix well. 4. Sift the dry ingredients into the bowl with the wet ingredients and stir vigorously with a wooden spoon for 30 seconds, until you get a shaggy dough. 5. Cover dough with plastic wrap and place it in a warm place, allowing the dough rise for at least 60 to 90 minutes, until the dough has doubled in size. 6. As dough is rising, pre-heat the oven to 400 degrees Fahrenheit (200 degrees Celsius) and grease a baking sheet. 7. Once dough has doubled in size, transfer dough to the prepared baking sheet and shape into a round loaf. 8. Cut two lines on top with a sharp knife. 9. Bake dough for 40 to 45 minutes until golden brown on top. 10. Allow bread to cool completely before slicing into pieces. 11. Store the rustic paleo country loaf in an airtight container. Bread will keep for up to a week in the refrigerator or up to three months in the freezer. I don’t know of anyone who doesn’t enjoy a hamburger every once in a while. Being on the paleo diet, it’s easy to miss eating normal hamburger buns so today we’re going to be making these super simple paleo almond hamburger buns! These buns come together in just 30 minutes, are fluffy and delicious and are perfect for your burgers! Start off by pre-heating the oven to 350 degrees Fahrenheit (180 degrees Celsius). Grease six round hamburger molds and line a baking sheet with parchment paper or a silpat, then place the greased molds on the baking sheet. Whisk the eggs and melted coconut oil together in a large bowl until combined. Next, sift in the almond flour, baking powder and salt and mix well until you get a homogeneous liquid batter. Distribute the batter evenly between the prepared molds (roughly half cup of batter per mold) and sprinkle sesame seeds on top of the batter. Bake for 15 to 20 minutes until golden brown on top. Allow the paleo almond hamburger buns to cool for at least 10 minutes before removing them from the molds. All that’s left to do is to tuck in and enjoy! 1. Pre-heat the oven to 350 deg. Fahrenheit (180 deg. Celsius). 2. Grease six round hamburger molds and line a baking sheet with parchment paper or a silpat. Place the greased molds on the baking sheet. 3. Whisk the eggs and melted coconut oil in a large bowl until combined. 4. Sift in the almond flour, baking powder and salt and mix well to get a homogeneous liquid batter. 5. Pour the batter into the prepared molds (around ½ cup of batter per mold) and sprinkle sesame seeds on top of the batter. 6. Bake 15 to 20 minutes until golden brown on top. 7. 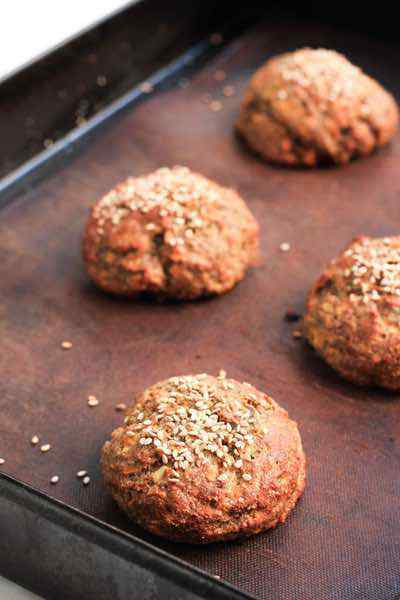 Allow the paleo almond hamburger buns to cool for 10 minutes before removing from the mold. 8. Eat immediately, or store in an airtight container. Buns will keep for up to a week in the refrigerator of up to three months in the freezer. When I was traveling around Italy, I loved that fact that restaurants always gave you a bread basket before your main course arrived. 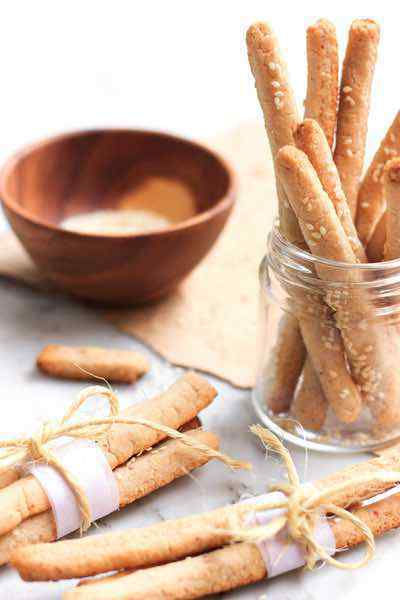 I enjoyed nibbling on the different types of breads that came in the basket, and of all them, I had a special preference for crunchy breadsticks that you could dip into olive oil or other types of sauces. 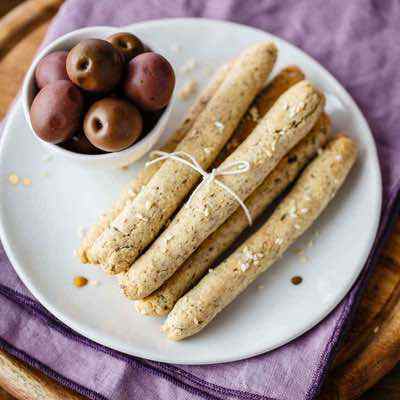 Today, we’re making a paleo version of those delicious breadsticks – a version that is healthy, low-carb and still every bit as good! Begin by pre-heating the oven to 350 degrees Fahrenheit (180 degrees Celsius) and lining a baking sheet with parchment paper or a silpat. Combine almond flour, tapioca starch, baking powder and salt in a large bowl and mix well. Add in room-temperature water and melted coconut oil and mix very well until you get a homogeneous dough that you can shape into a small rectangle. The dough will be sticky, but spreading a bit of tapioca starch on your handles will make it easier to handle. 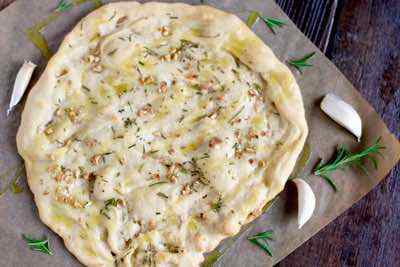 Place dough between two large sheets of parchment paper and roll it out into a 1-inch thick rectangle that is approximately 12-inches long. Use a sharp knife to cut the dough into 18 pieces (each piece 12-inches long). Next, grease your fingers with some coconut oil to round the edges of each breadstick, before transferring the breadsticks onto the prepared baking sheet (leaving 1 inch of space between each breadstick.) 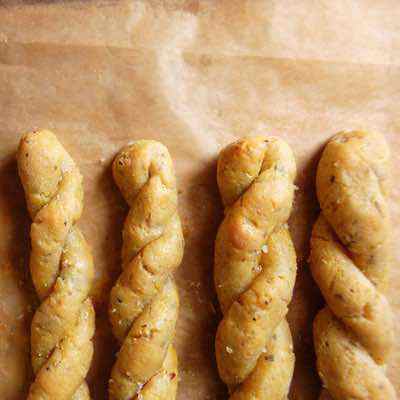 Brush breadsticks with melted coconut oil and then sprinkle with sesame seeds, then bake for 15 to 18 minutes until breadsticks are crunchy and golden brown. Enjoy the breadsticks immediately or store in an airtight container at room temperature for up to a week. Enjoy! 9. Eat immediately or store in an airtight container for up to a week. For many of us, bread is essential in our meals – as an appetizer, as a side dish for mopping up leftover pasta sauce or simply to nibble on. Bread rolls in particular are one of my favorite ways to start off a meal. Today, we’re making paleo bread rolls, which taste almost like real bread, but are healthier and quicker to make, without any yeast involved! Start off by pre-heating the oven to 350 degrees Fahrenheit (180 degrees Celsius) and line a baking sheet with parchment paper or a silpat. In a medium bowl, combine the tapioca starch, almond flour, salt and baking powder and mix well. In a large bowl, whisk the egg, water and melted coconut oil together until combined. Add the dry ingredients to the wet ingredients and stir very well until you get a thick but moist dough. Scoop the dough by heaping tablespoons and then roll the dough into balls between your palms (you should be able to get about six balls). Once balls are rolled, place them on the prepared baking sheet five inches apart and sprinkle dried oregano on top. Bake the bread rolls for 15 to 20 minutes, until the bottoms are slightly golden brown. Allow the bread rolls to cool for at least 10 minutes before eating! They taste amazing slathered with coconut oil, just so you know! 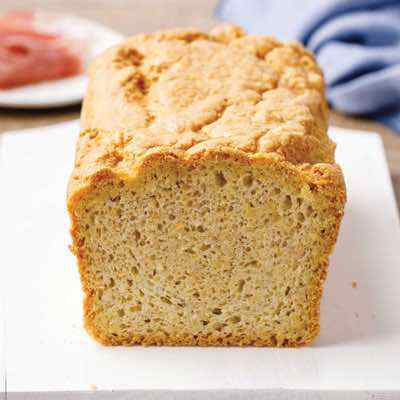 I enjoy a good loaf of freshly baked bread, and I especially love a loaf that is rich in fiber and nutrients and texture. 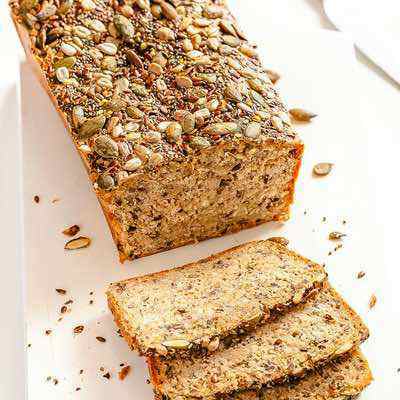 Today we’ll be baking a large loaf of paleo multi-seed bread that is filled with a variety of seeds. This is denser than your normal bread but tastes amazing and goes great with sweet spreads or savory foods. Start off by pre-heating your oven to 350 degrees Fahrenheit (180 degrees Celsius). Next, grease and line a large loaf pan with parchment paper. Allow extra parchment paper to hand from the sides so that it’s easier to remove the loaf once baked. In a large bowl, combine almond flour, sunflower seeds, sesame seeds, flaxseed meal, chia seeds, salt and baking powder and mix well, then add in the water and eggs and stir well until you get a homogeneous batter. Note that the batter will be quite liquid but that is fine. Pour the batter into the prepared loaf pan and sprinkle sesame seeds on top, then bake for 55 to 60 minutes, until a toothpick inserted in the middle comes out clean. Allow the bread to fully cool before removing it from the pan and slicing it into pieces. I’m sure you’ll love this beautiful bread as much as I do. 1. Pre-heat oven to 350 deg. Fahrenheit (180 deg. Celsius). Grease and line a large loaf pan with parchment paper. Allow extra parchment paper to hand from the sides so that it’s easier to remove the loaf once baked. 2. In a large bowl, combine almond flour, sunflower seeds, sesame seeds, flaxseed meal, chia seeds, salt and baking powder and mix well. 3. Add in the water and beaten eggs and stir well until you get a homogeneous batter. The batter will be quite liquid, but that is the way it’s supposed to be. 4. Pour batter into the prepared loaf pan and sprinkle sesame seeds on the top of the batter. 5. Bake batter for 55 to 60 minutes, until a toothpick inserted in the middle comes out clean. 6. 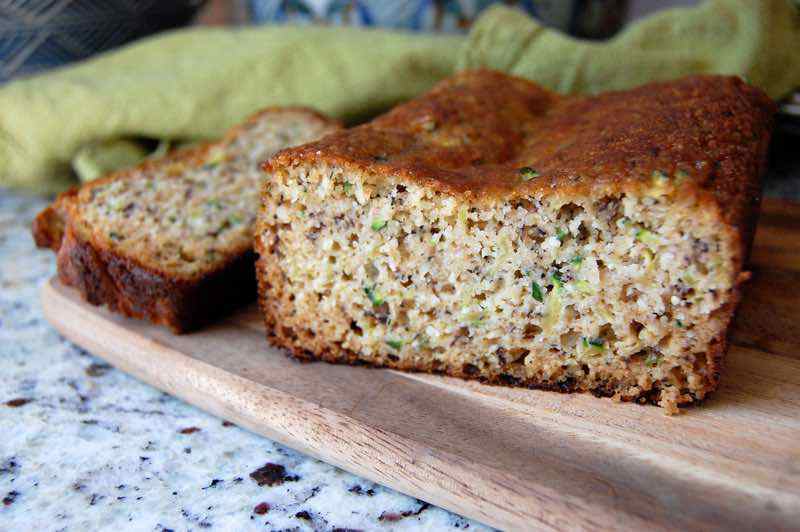 Allow paleo multi-seed bread to fully cool before removing it from the pan and slicing it into pieces. 7. To store the bread, wrap it in plastic wrap and keep it in the refrigerator for up to 3 days or in the freezer for up to 3 months. Baking bread is one of my favorite things to do, and smelling the aroma of a fresh loaf of bread in the kitchen is just amazing. 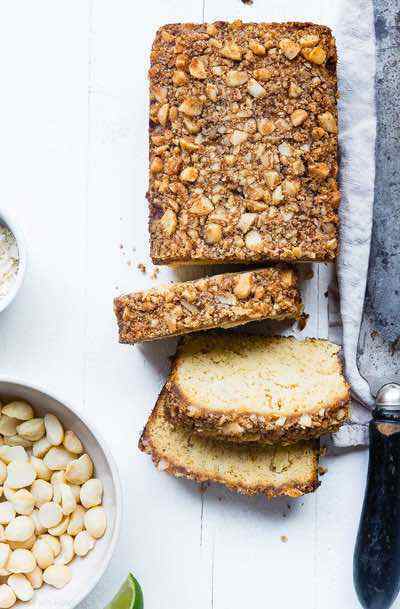 Today’s paleo coconut almond bread is easy to bring together, is made in just 50 minutes, and I guarantee that you will absolutely love it. Start off by pre-heating your oven to 350 degrees Fahrenheit (180 degrees Celsius) and grease and line a large loaf pan with parchment paper. In a large bowl, combine the melted coconut oil, eggs and apple cider vinegar and then whisk until well combined. In a medium bowl, combine shredded coconut, almond flour, salt and baking powder and mix well. Add the dry ingredients to the wet ingredients and stir well until you get a homogeneous batter. If the batter is too liquid, add an extra tablespoon of shredded coconut, but bear in mind that the batter should be easy to pour into the pan. 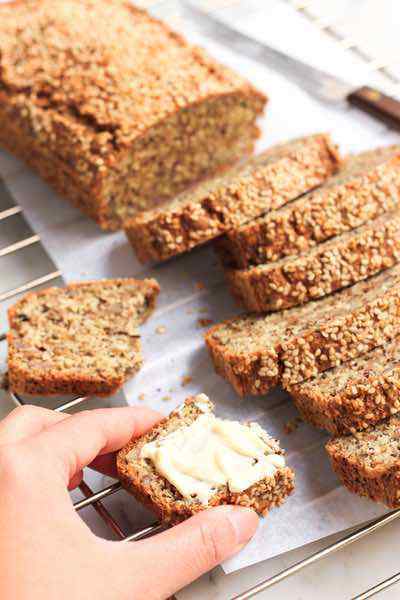 Pour the batter into the prepared loaf pan and sprinkled golden flaxseeds and sesame seeds on top of the batter. Bake the batter for 40 minutes until a toothpick inserted in the middle comes out clean. Be sure to allow the bread to cool for at least 15 to 20 minutes before removing from the pan and slicing into pieces. This bread is amazing by itself, or better yet, toast it and eat it with scrambled eggs and some bacon! You can also slather it with marmalade and eat it for tea! 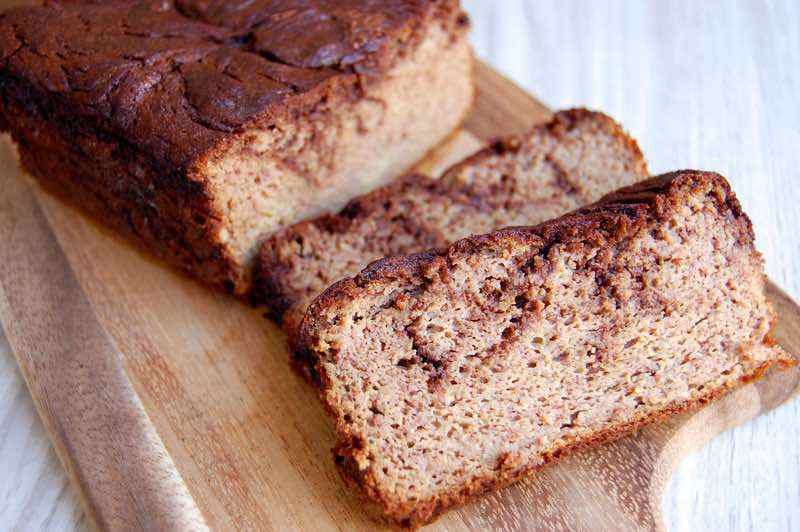 Either way, this paleo coconut almond bread is just amazing! 1. Pre-heat oven to 350 deg. Fahrenheit (180 deg. Celsius) and grease and line a large loaf pan with parchment paper. Allow extra parchment to hang from the sides so it will be easier to remove the bread once baked. 3. In a medium bowl, combine shredded coconut, almond flour, salt and baking powder and mix well. 4. Add the dry ingredients into the bowl with the wet ingredients and stir well. If the batter is too liquid, add an extra tablespoon of shredded coconut. Note that the batter should be easy to pour into the loaf pan, and it shouldn’t be too thick. 5. 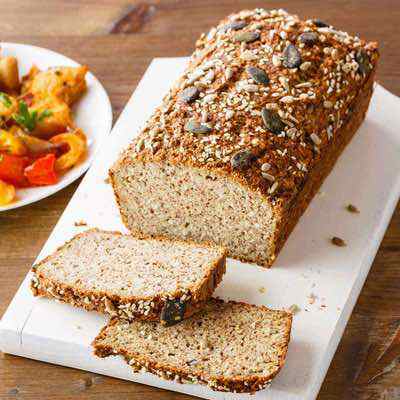 Pour batter into the prepared loaf pan and sprinkle golden flaxseeds and sesame seeds on top of batter. 6. Bake for 40 minutes until a toothpick inserted in the middle comes out clean. 7. Allow bread to cool for 15 to 20 minutes before removing from pan and slicing into pieces. I use rosemary in a lot of my savory recipes, firstly because I have a rosemary plant in my kitchen and secondly because it gives any recipe a beautiful fragrance and flavor. Today, we’re making a large loaf of paleo rosemary almond bread that has a moist crumb and is both delicious freshly baked or toasted. Start off by pre-heating the oven to 350 degrees Fahrenheit (180 degrees Celsius) and grease and line a large loaf pan with parchment paper. Combine the almond flour, unsweetened shredded coconut, flaxseed meal, chopped rosemary, salt and baking powder in a large bowl and mix well. Add in the beaten eggs, melted coconut oil, apple cider vinegar and water, and then stir thoroughly until you get a homogeneous batter. Pour batter into the prepared loaf pan and bake for 35 to 40 minutes until the bread is golden and a toothpick inserted in the middle comes out clean. Allow the bread to cool for at least 15 minutes before removing it from the pan and slicing it into pieces. Enjoy! 1. Pre-heat oven to 350 deg. Fahrenheit (180 deg. Celsius), and grease and line a large loaf pan with parchment paper. 2. 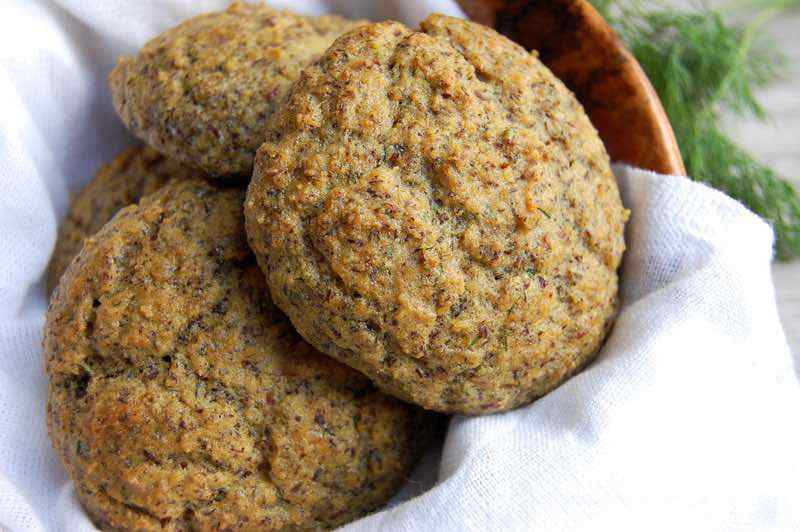 In a large bowl, combine almond flour, unsweetened shredded coconut, flaxseed meal, chopped rosemary, salt and baking powder and mix well to combine. 3. Add in beaten eggs, melted coconut oil, apple cider vinegar and water and then stir thoroughly until you get a homogeneous batter. 4. Pour batter into prepared loaf pan and bake for 35 to 40 minutes until golden and a toothpick inserted in the middle comes out clean. 5. Let bread cool for at least 15 minutes before removing from pan and slicing into pieces. 6. Store paleo rosemary almond bread in an airtight container. Bread will keep for up to a week in the refrigerator and up to three months in the freezer. Dinnertime almost doesn’t feel completely without buns to accompany the main meal, and while I love most paleo buns, most of them usually contain some kind of nuts, which many people can be allergic to. Today, we’re making nut-free paleo buns that are even those of you with nut allergies can enjoy! These buns not only look just like normal buns, they also have an incredibly moist crumb that is great for soaking up sauces or spreading butter on! Start off by pre-heating the oven to 350 degrees Fahrenheit (180 degrees Celsius) and lining a baking sheet with parchment paper or a silpat. Grind the sunflower seeds, chia seeds and flaxseed in the blender until you get a fine meal and then transfer it to a medium owl. Add in the baking powder and salt and mix well. Next, place the apple pieces in the blender and process them until you get an apple puree. 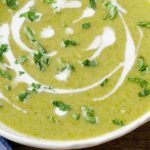 Transfer the apple puree into a large bowl and add in the eggs, whisking well until you get a pale and frothy mixture that has almost doubled in size. Sift the dry ingredients into the bowl with the wet ingredients, combining them first with a whisk and then a spatula until fully incorporated. Allow the dough to rest for 10 minutes. The dough will thicken. Divide the dough into 6 even portions and shape them into round buns. Place the buns onto the prepared baking sheet about three inches apart, and flatten them slightly with your fingers. 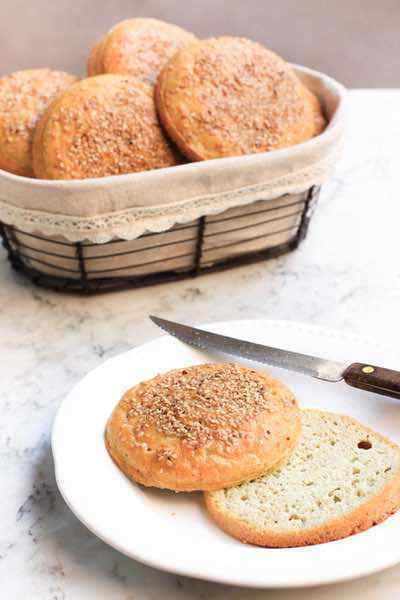 Sprinkle the tops with white sesame seeds and then bake the buns for 30 to 35 minutes, until brown on the outside. Allow the buns to cool for at least 10 minutes before eating. Enjoy! 1. Pre-heat the oven to 350 deg. Fahrenheit (180 deg. Celsius) and line a baking sheet with parchment paper or a silpat. 2. Place the sunflower seeds, chia seeds and flaxseeds in the blender and grind them until you get a fine meal, then sift them into a medium bowl. 3. Add in baking powder and salt and mix well. 4. Place apple pieces in the blender and process until you get an apple puree. 5. 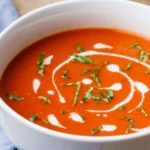 Place apple puree in a large bowl together with the eggs and whisk until you get a pale and frothy mixture that is almost double in size. 6. Sift the dry ingredients into the bowl with the wet ingredients, combining them first with a whisk and then a spatula until fully incorporated. 7. Allow the dough to rest for 10 minutes. The dough will thicken. 8. Divide the dough into 6 equal portions and shape them into round buns. Place the buns on the prepared baking sheet, about 3 inches apart, and then press the buns down slightly to flatten and then sprinkle the tops with white sesame seeds. 9. Bake the buns for 30 to 35 minutes, until brown on the outside. Allow the buns to cool down for at least 10 minutes before biting into them. 10. To store, place the buns in an airtight container. Buns will keep for up to a week in the refrigerator or up to three months in the freezer. 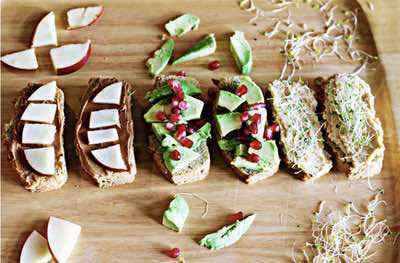 Alternatives to regular sandwich bread can be difficult to find on the Paleo diet. 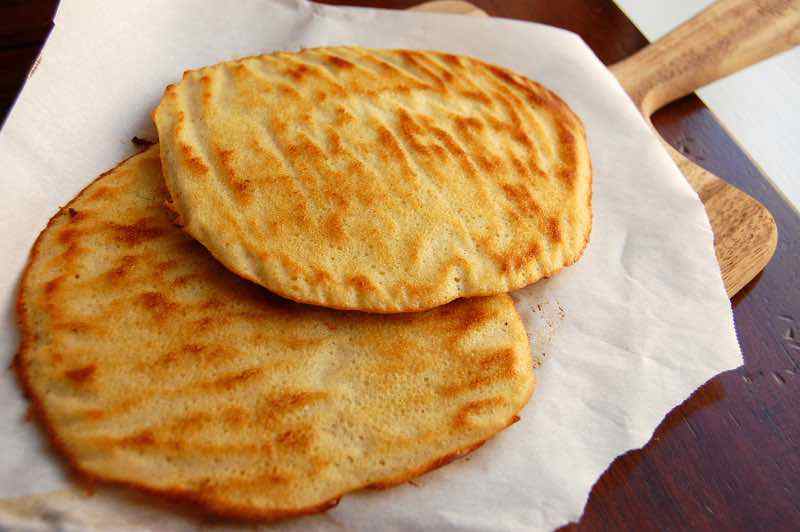 This pita bread is a wonderful gluten-free alternative that is also extremely easy to make, thanks to the recipe inspired by GlutenFreeFix.com. 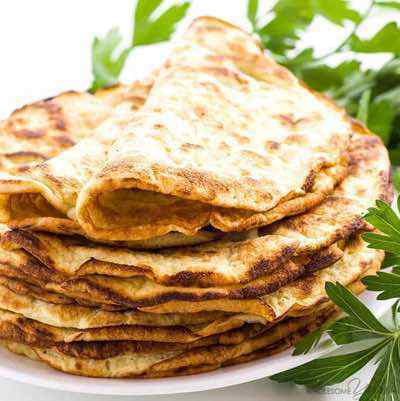 Prepare only the number of pitas that you plan to eat immediately, since they do not keep well in the refrigerator. The pita can sop up savory sauce or be dipped into hummus. Use it to hold a meatball sandwich, as a base for tuna salad, or for eggs and bacon – the possibilities are endless. 1. Preheat the oven to 350 degrees F. Line two baking sheets with parchment paper. Stir together the almond flour, coconut flour, salt, and baking soda. In a separate bowl, whisk together the eggs, water, coconut oil, and honey. Add the wet ingredients into the dry and stir well to combine. 2. Pour about 1/4 cup of batter onto the parchment paper and smooth into a large circle. Repeat with remaining batter. Bake for 15-20 minutes until set. Let cool for 5 minutes before serving. 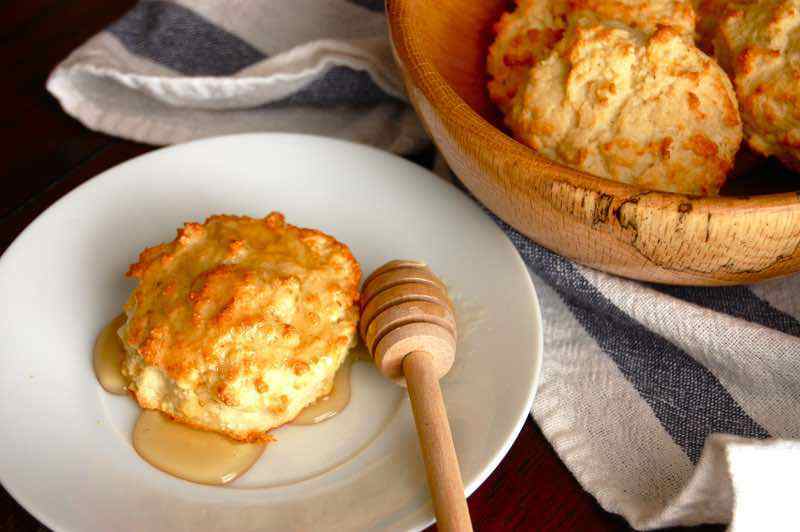 Biscuits are not only a great accompaniment to your dinner, they are the perfect vessel for mopping up a bowl of hearty stew. They also taste good all on their own drizzled with a little bit of honey. 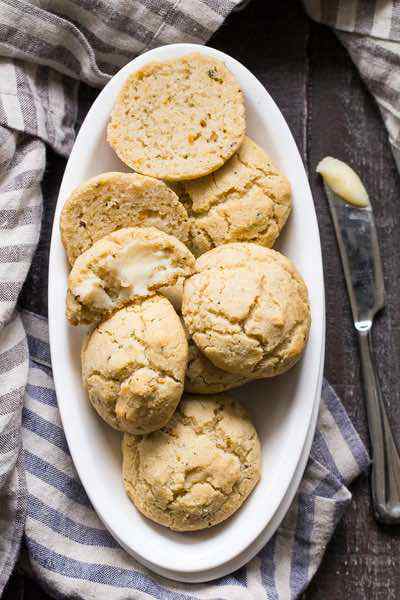 These biscuits are superb when eaten warm, right out of the oven. 2. In a separate bowl, beat the egg whites until stiff peaks form. Fold into the flour mixture until combined. 3. Line a baking sheet with parchment paper. Scoop about 1/4 cup of dough onto the baking sheet to form approximately 9 biscuits. Bake for 12-15 minutes, or until golden. Serve warm with a drizzle of honey. The dinner table is not complete without a basket of dinner rolls. 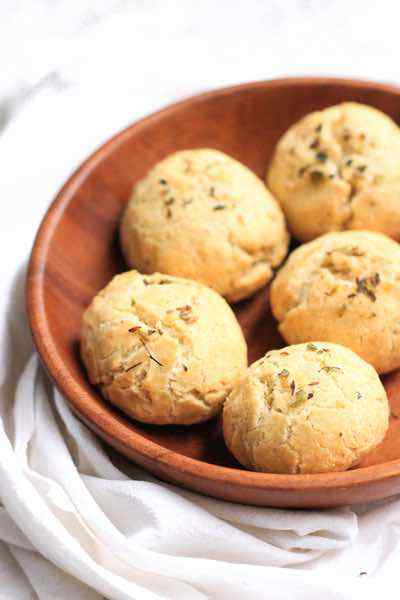 This Paleo-friendly version of dinner rolls features an abundance of fresh dill and gets its fluffy structure from flaxseed meal. Serve alongside your main entrée, or use as a bun for shredded pork or barbecue chicken. 1. Preheat the oven to 325 degrees F. Prepare a baking sheet with parchment paper. Mix together the coconut flour, flaxseed meal, baking soda, and salt in a medium bowl. In a separate bowl, whisk together the eggs, coconut oil, almond milk, apple cider vinegar, honey, and dill. Add the wet ingredients into the dry and stir well to combine. 2. Use your hands to form the dough into small balls and place onto the parchment paper. Bake for 25-30 minutes until the rolls are set. Serve warm. 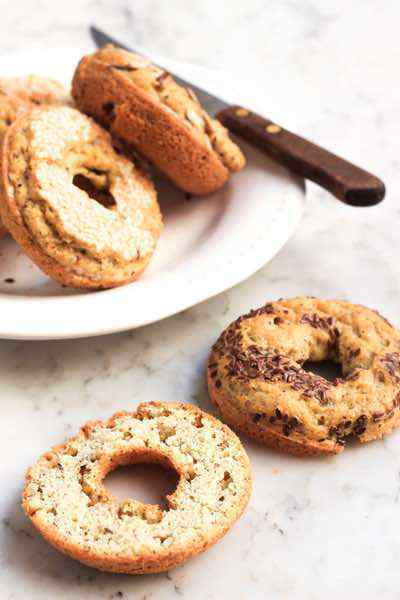 As the name suggests, almond flour is made from blanched, finely ground almonds. The flour is relatively high in protein and also contains many other nutrients such as Vitamin E, zinc, magnesium and iron to name a few. Substituting wheat flour with almond flour can however be tricky as the almond flour is gluten free. This means that if you are adapting a recipe, the consistency of the end product could be quite different. Without the gluten you will lose some elasticity. 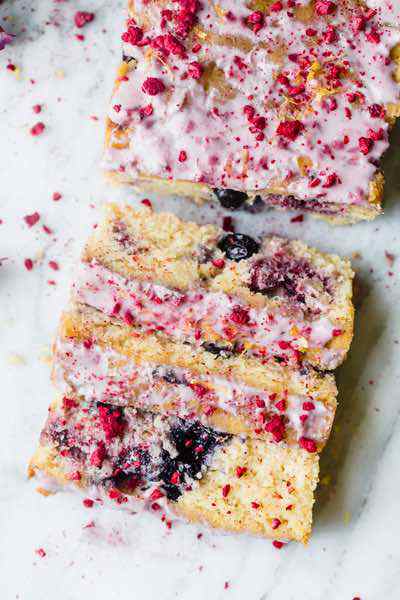 The down side is that almond flour, by nature, is at least twice as expensive as traditional cake flour but by making it at home you can cut costs. 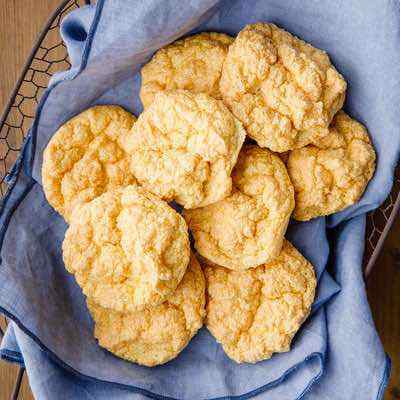 The added advantage is that you can make ahead of time and your do-it-yourself flour will stay fresh in the freezer for up to 3 months at a time. If you are using the flour from your freezer, simply remove the amount you need. Allow it to stand for 20 minutes and it’s ready to go. Coconut flour is made from the dried out pulp of a coconut. It is a delicious gluten free, Paleo suitable flour. It is also a healthy source of fibre, protein and fat. In terms of baking with coconut flour it is important to realize that adapting recipes can be tricky due to how absorbent coconut flour is. Coconut flour absorbs an incredible amount of liquid, so you can work on using a 1/3rd of the amount of coconut flour in comparison to ordinary flour. Another fact to be aware of is that most recipes using coconut flour normally contain lot of eggs! This is necessary to bind the ingredients in the recipe together. 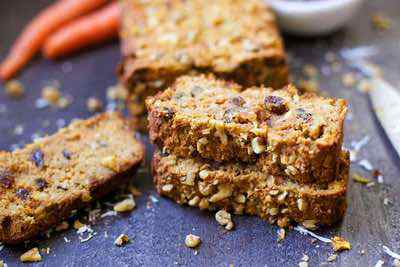 Tip: There are hundreds of tried and tested recipes out there, rather follow one of these Paleo coconut bread recipes here, and avoid expensive an disappointing results. When it comes to consistency and texture, cassava flour is the one Paleo friendly flour, which behaves most like wheat flour. This makes it a favorite flour to make Paleo breads with. With most recipes you will be able to use a 1: 1 replacement ratio, making our lives so much easier! An added bonus to being gluten free is that this flour also supplies a welcome alternative to people who suffer from nut allergies. It really is a winning flour substitute. There is a downside to utilizing this flour. It has a high carbohydrate content. If you are monitoring your sugar and carbohydrate intake very closely and are not particularly very active it would be wise to consume products made with this flour, in moderation. Surprisingly, despite the name, this flour is actually not made from a nut but rather a small root. It is therefore highly suitable for those who struggle with nut allergies. Tigernuts were originally found in Northern Africa and the Mediterranean. If we had to go back a few million years, Tigernuts would have made up about 80% of our Paleo diet. Tigernuts not only contain fibre, iron and potassium but also act as a functional food, a prebiotic (fuel for the good bacteria in your gut to thrive). A second advantage is that this flour can be used in a 1:1 ratio when adapting your favorite bread recipe. 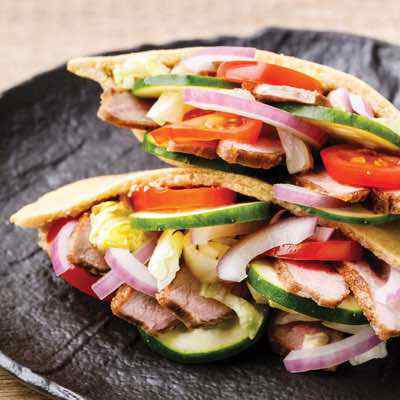 Paleo eating lends itself to sandwiches, but many Paleo dieters go without because they think they can’t have bread. But with this bread specifically made to accommodate a sandwich, you can’t go wrong. 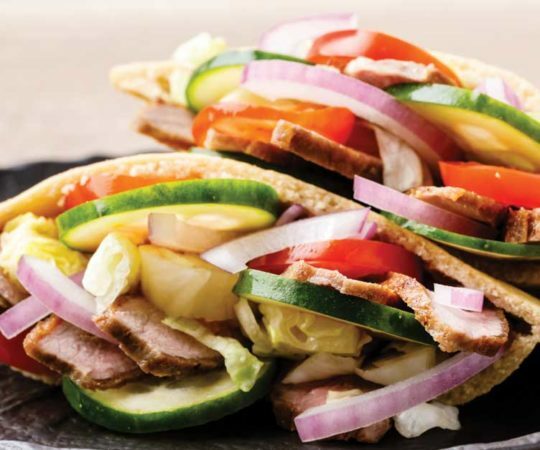 Just make sure your sandwich is piled high with meat and vegetables, the two staples of the Paleo method of eating. The ingredients list on this bread is amazing, with real wholesome ingredients, and nothing artificial used. 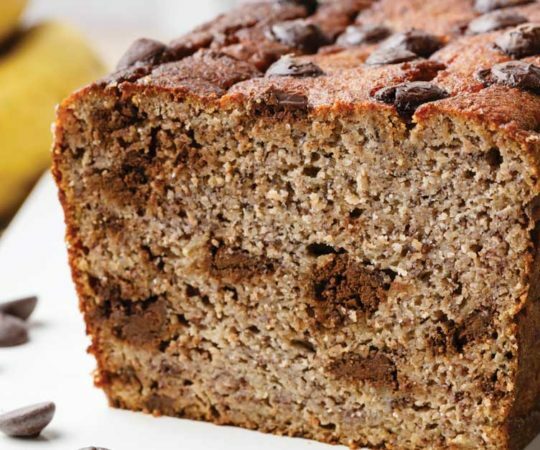 Coconut flour gets the call as the wheat replacement, and there’s even flax used so you’re getting a dose of omega-3s. If you’re an English muffin lover it won’t be long before you’re hit with a craving and won’t know what to do to stay on track with your Paleo diet. This English muffin recipe does away with the grains and delivers true muffin taste nonetheless. These have all the little holes and crevices you’d expect from any respectable English muffin, and you can feel free to spread organic grass-fed butter over this, or some nice organic ghee for an out of this world totally Paleo experience. Using sweet potatoes as your base ingredients serves a few purposes. First, it makes it so you don’t have to use a wheat or grain source as the main ingredient. Second, it provides plenty of antioxidants and vitamin support from the sweet potatoes, as well as additional fiber. 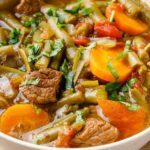 You’ll still want to get a serving of vegetables in with your meal, as this doesn’t really cut it if you’re having a nice portion of meat with it. Think green leafy vegetables in a salad and you’ve got a nice balanced Paleo meal. Garlic bread goes great with any of the Paleo pastas we recommend. You’ll be blown away by how easy it is to make this, and how few ingredients it takes. You’ll also likely be pleased to see that it’s all natural ingredients with nothing artificial added, right down to using actual garlic for the garlic flavor. It’s amazing how many commercial foods have garlic flavor but don’t actually include any real garlic. Getting the grains out is pretty much the top priority when you make a bread that is Paleo approved. That’s what we’re seeing here is the use of coconut flour instead of wheat-based flour. You’re going to get a milky taste from this because they’ve used almond milk, and a creamy taste because there’s cashew butter. 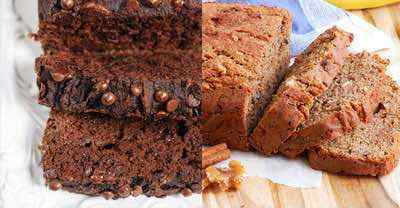 This should give the bread a smoothness that you won’t find with other breads on the list, which might make it preferable to some, and others may prefer the other types made out of almond flour or that contain flax meal. 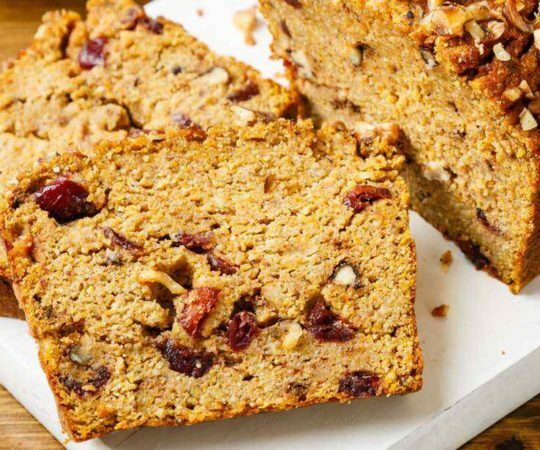 This raisin bread will have you wondering if it really is Paleo, or if you’ve just cheated on your diet program. But no worries, everything checks out and you can eat this in moderation just like anything else dubbed acceptable. 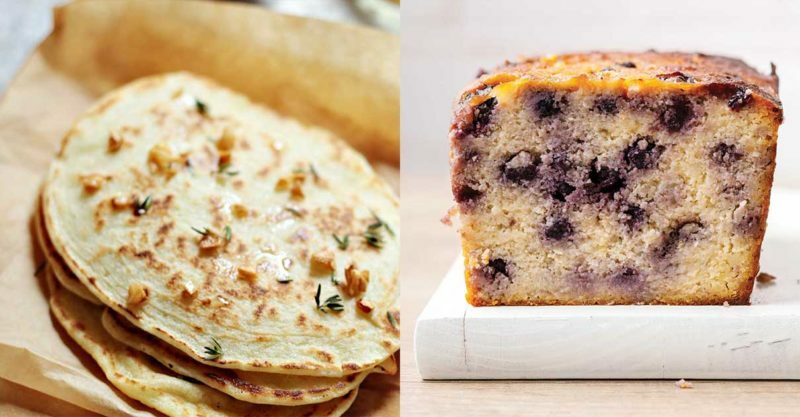 With ingredients like sweet potatoes, coconut flour, eggs, butter, and raisins, how can you go wrong? 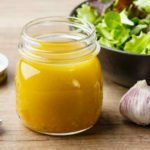 She’s managed to exclude all of the things that give the body a hard time in regards to digesting and processing, and replaced them with items that are known to be easy to digest and absorb. 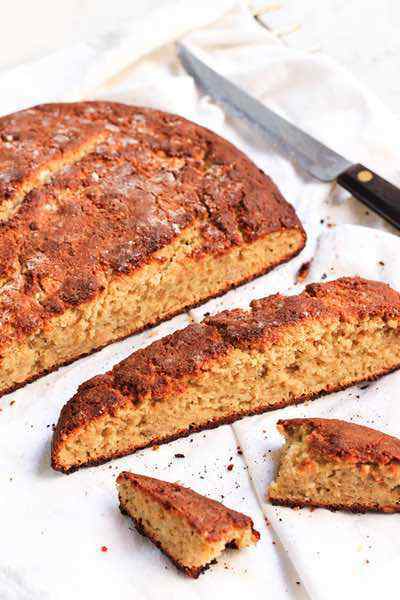 You don’t always have to have ordinary bread when it comes to Paleo bread, and this recipe lets you have focaccia bread, which can really open the doors for a lot of gourmet sandwiches. Picture some nice organic roasted turkey breast resting between a few slices of focaccia, and some nice grilled vegetables to top it off. That’s the sort of meal that will leave you totally satisfied, and won’t put a dent in your waistline. 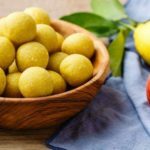 The use of flaxseed meal, almond flour, whole eggs, and Extra Virgin Olive oil keeps you on the approved foods list and results in zero guilt. Great grain free bread round up! Thank you for including me in it! Will share and pin it. 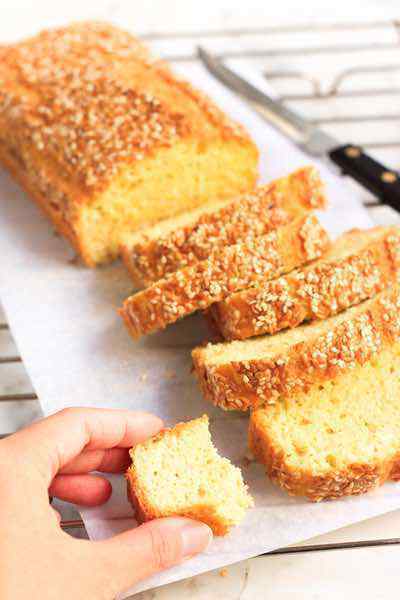 Thank you for featuring my sandwich bread recipe! It’s delicious and also makes great French toast! What did I do wrong? Made the grain free/vegan bread and it just crumbles, no chance of cutting it. How long do you have to beat before it comes together in a “firm ball”. That never occurred and I put it into the pan at the semi-firm stage, after beating what seemed like forever, and it just falls apart. I’m so sorry your bread crumbles, that’s so disappointing. That your dough didn’t become a firm ball indicates that a measurement might have been off. 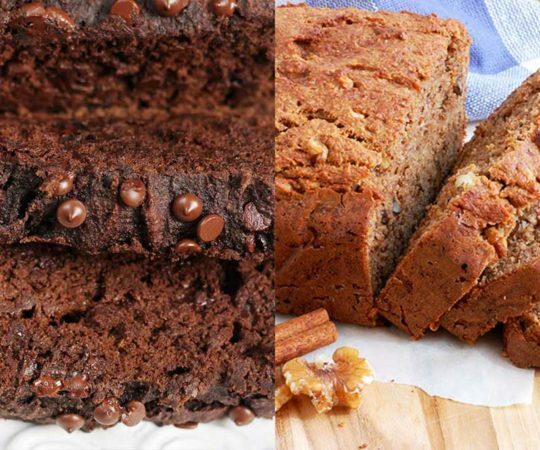 My best recommendations for baking grain-free include having all ingredients at room temperature, have the oven preheated, to measure everything accurately and to notice if things are happening the way they are supposed to, ie. : your dough is not firm. A soft dough would need you to add more flour to it, although if the dough is too soft because too much milk or fat was added, it will throw off the balance of everything else. Baking is very precise in this way, try it again and keep me posted on the outcome. Can I really eat Dave’s Killer bread on the Paleo diet? As with all of your food choices, you have to decide. Read the label and check the ingredients, is it a grain-free paleo bread? 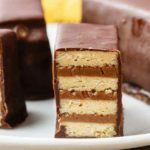 If so, YAY, if not, and you are wanting to eat strict paleo, make one of the recipes in this post, you won’t be disappointed. Grease a coffee mug with coconut oil. Mix and mash together all the ingredients with a fork in a bowl. Microwave for 3 minutes on high. Check it. Cook in 30 second intervals until mostly set (mine looked a tiny bit mushy on top after 3 minutes 30 seconds. Cover with a cutting board or plate and turn upside down leaving the hot mug over the bread. Pop out of mug gently and slice. 1/2 of the “loaf” is about 310 calories of healthy fat, protein, and fruit. Would it be horrible to mix up the ingredients and freeze it to bake later? I can go on and on about how busy I am and blah blah blah, really I’m just lazy and know I may not make it if it’s not super convenient. #thestruggle These all look great! It probably wouldn’t be horrible, but you’d have to plan ahead and let it defrost and bake it, which only sounds like more work…so I am going to recommend,the single serve bread and the microwave bread. 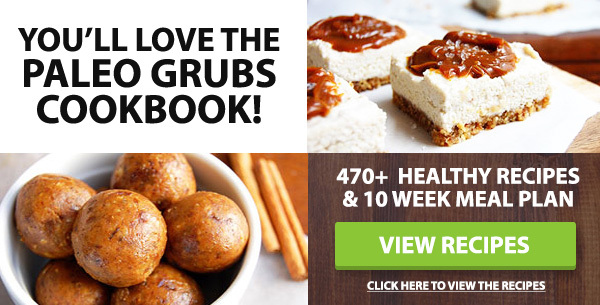 Those are recipes that you can whip up and cook in no time. Otherwise make the recipes, the bread and then freeze it. Let me know what you do. When you cook breads with the Coconut flour does it come out w/ the coconut taste? 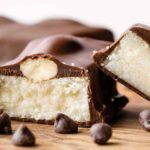 I am no fan of coconut but I would love to have more recipe options so I am interested in trying the ones made with the coconut as the alternate but am scared to try it. Is anyone else not a coconut fan that can weigh in? Breads and other foods made with coconut, will have a coconut flavor and some added sweetness. I really like coconut and barely notice it, especially in recipes with seasonings. Maybe give the garlic breadsticks a try? They have lots of herbs and garlic and are very good. Let me know if you try them. I’m allergic to eggs. 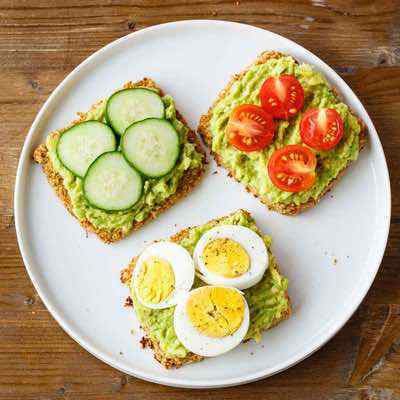 What can I sub for eggs in the bread recipes? Flax seeds are a great egg substitute. Google it for instructions. You can use equal parts of flax and water, or chia too! pureed apples, prunes, or bananas or nut butters. Hope these suggestions help, let me know what you try and how it works. I REALLY need to find a wheat and lactose free recipe for a curry accompaniment , i.e. nan , Chapati etc. I can make a great curry, but the bread aspect is a really causing a big problem. Nan has yogurt, therefore lactose etc. I know I’m not talking Paleo with this (this is a medical thing), but maybe somebody out there has a recipe that qualifies as Paleo , gluten and lactose free. 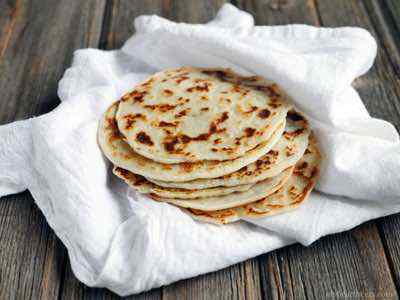 Have you tried the flatbread recipe from this post? It’s really good, while the recipe does call for butter (you can use ghee, if that works for your dietary needs) or coconut oil. Let me know if you try it and how it works out. I am also curious if I can substitute the coconut flour for something else like tapioca or arrowroot? I don’t mind if for the sweeter breads but i don’t want to taste in in the “regular, everyday” bread. You can adjust flours in recipes, but you’ll have to be open to experimenting. When you substitute coconut flour, you’ll want to adjust the quantity of the replacement flour and add just a bit more fat. Or if you don’t like experimenting, you can look for recipes that do not contain coconut flour. Good luck and let me know how it goes. I was wondering if anyone has any advice for me. I have a nonverbal two-year-old son. We are trying to move him off of grains completely, but the only thing I can get him to eat is an almond butter and honey sandwich. Just about every type of grain free bread I’ve tried he has discarded. I’m worried that he is so addicted to bread that it is limiting his world, not only are there different types of foods that he’s missing out on, but also his consumption of gluten may be affecting his development. I’ve tried withholding, and he just chooses not to eat anything at all. Has anyone gone through this successfully? Hello, I had similar problem (not as drastic) with my son. If the bread you are giving him is gluten free he is getting no gluten. Try putting a piece of cheese with a dab of honey on his plate and see if the picks it up eventually. Don’t mention anything different. Also a very thin slice of apple or banana with almond butter on it. Just Introduce different things but about the same size and coloring. Next He needs to be on a protein shake with hidden kale in it. You must start slow with almond milk and ice and honey. See if he will drink it with a straw? If you can continue adding other things– he will pick it up eventually. Also use behavior modification by telling him if he tries the shake ( one sip at first) you will let him watch a favorite show or movie. He likes these flavors already. Good Luck. Wendy, I’m just a grandma, who has not experienced your issues, but I wonder what else your son eats. does he eat apple sauce? 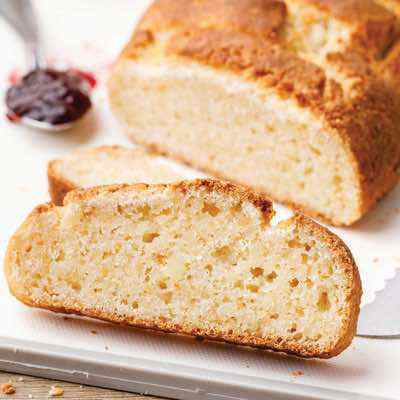 try making a bread with coconut flour, eggs and let him add apple sauce to it. 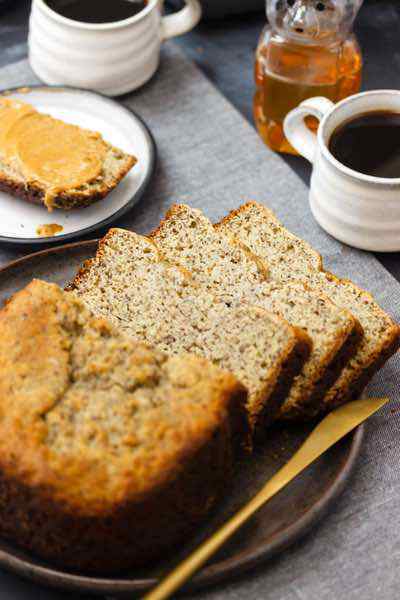 the apple sauce will provide sweetness, the coconut flour is said to offer more of a normal bread consistency, the eggs bind the coconut flour together. remember that coconut flour is VERY absorbent. you only need a little. I’m going to suggest microwave muffins in a cup so you don’t have to make so much only to have him reject it. here is a sample recipe for you to try. 1 packet of stevia or one tsp of honey. 1/8 tsp of salt, which can be omitted for one so young but I like it. mix the wet ingredients beating til well mixed. combine and pur into a mug sprayed with pam or greased with coconut oil. bake in the microwave for 1-2 minutes til a toothpick comes out clean. This recipe is very similar to a one minute muffin but has salt, applesauce and coconut oil added for moistness. if you want it firmer, leave out the coconut oil since the apple sauce is meant to be a draw for you son. or cut back on the apple sauce. 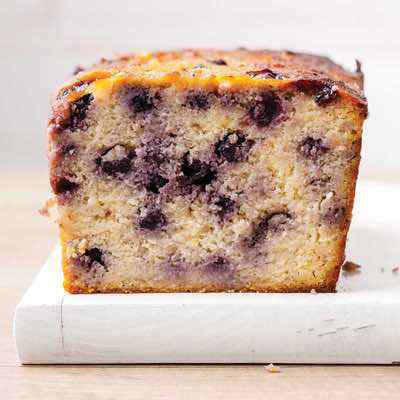 as created the recipe will be a moist muffin which can be sliced cross wise into rounds and topped with your choice of toppings. 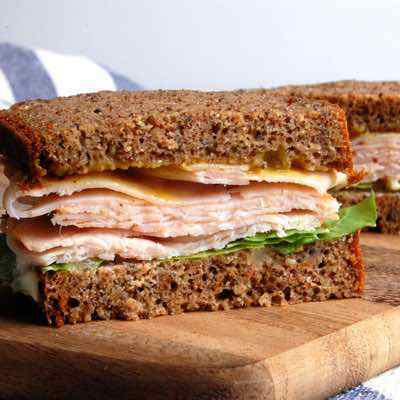 to make a sandwich you might have to make it firmer or cool it in the fridge to make the slices thinner. this recipe will also make about three 4 inch pancakes. if fried in coconut oil. forgot to say, let the mixture sit for a minute before cooking so the coconut flour absorbs some of the moisture. I think it helps the texture. This must be so challenging and stressful for you, but know that young children can be very picky eaters. Typically young children like very bland, slightly sweet tasting foods, so I can see why he would like an almond butter and honey sandwich. 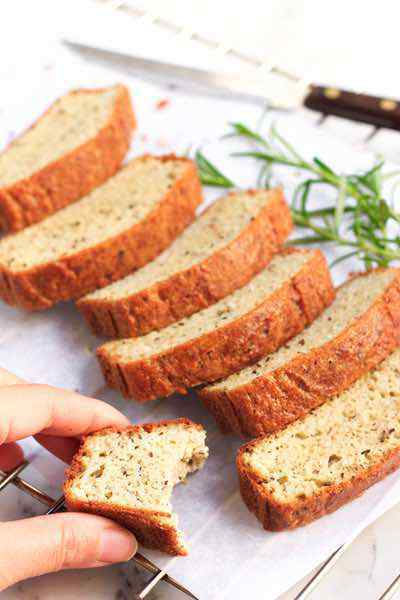 If you can find a grain free bread that looks like the bread he likes to eat, use one slice of regular and one slice of grain-free (keeping the grain free on the bottom). 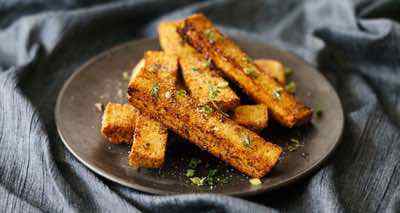 And/or as he is resistant to grain free bread at this time, maybe focus on introducing other foods that he may enjoy such as cucumber, red pepper or apple slices, small pieces of cooked chicken or sweet potato and serve these with a side of almond butter to dip them into. 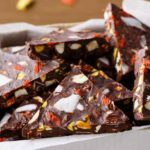 Try introducing grain free crackers, cookies or muffins as well as paleo smoothies (into which you can sneak some greens), keep the portions small and offer him variety alongside his sandwich. He may also like the entire routine of meals and may enjoy the same meal at the kitchen table or in his highchair, so maybe packing a picnic and eating at the park might help him to try some new flavors. I hope these suggestions help, keep us posted on how things go. I’m not a believer in vegan or Paleo diets. I believe in a healthy diet that leans somewhat in the vegetarian direction and I just became convinced of the need to eliminate wheat from my diet. I applaud this website and the author for providing me with the bread alternatives I was looking for. I also appreciated the open eclectic attitude of the author in including some items recommended by vegans. Still, I believe red meat should be avoided . Thank You. Unfortunately I think our concept of a healthy diet has been perpetrated upon us by big Pharma. 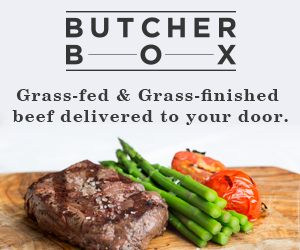 I think red meat from grain fed cattle and sheep IS bad for us . These animals were designed to eat grass. We were designed to eat meat, fat, vegetables , a few seeds and a little seasonal fruit. But never any kind of grain. ! When Man began farming and grain consumption , so began disease and illness. Today our food supply is being contaminated by Factory farming and GMOs. There has been so much nutrition and dietary mis-information in the past 100 years, it’s very confusing to sort it all out. I’m thankful I found Paleo! And as paleo shoppers, we know to avoid the center of the market and stick to the outside loop which is where we find the lean proteins, the nuts, seeds, greens, vegetables and fruits. It not only saves us time when we shop, it keeps us healthy. I’m so glad that you found this post and that you can enjoy some grain-free bread. Paleo offers a base structure of foods that are easily digestible for our bodies based on our genetics, but each of us can make decisions about what we eat based on our beliefs. I absolutely agree with you, because I believe in a healthy diet as well! Let me know which of these recipes is your favorite. I have a daughter who has the same basic problem with her 5 year old son…not eating what’s good for him. If you’ll give me your email address, I’ll send that on to her, and she can email you. She’s still got the same issues, but is just thought you and she could write to each other. BTW, my other daughter’s name is Wendy! Thanks for reading this post. Of these recipes, pick one that sounds good to, and try it. 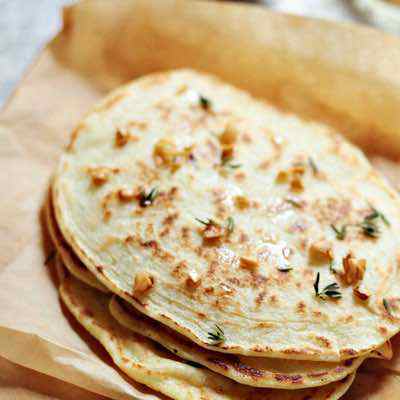 These are all good recipes and fairly easy to make, I like to make the Cheesy Tapioca Flatbread, as its pretty quick and tastes great. 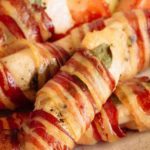 I’ve got lots of paleo resources and recipes on here, so click around to find out more about paleo. Keep me posted on how things go and always feel free to share a story or ask a question. 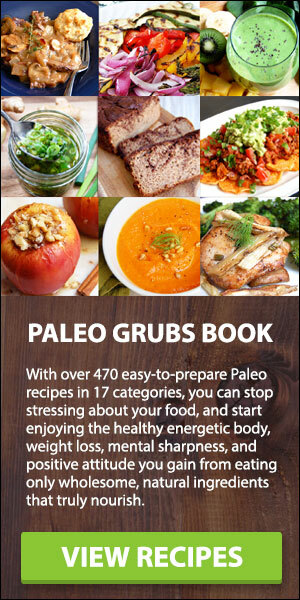 After 30 years of pain..heavy fatigue..etc etc etc..I have been shocked into this new world of paleo…and I feel great..it’s a dream come true! I can’t begin to describe the difference that being grain free has made. I am excited to know there are breads I can have. I feel so free that I’m in tears!